Whole our science, in the comparison with the reality, is primitive and childish. But still it is the most valuable thing which we possess. Lecture “From Regional to Local Level in Social Sciences” by dr Ana Viñuela from University of Oviedo. The Institute of Geography and Spatial Organization Polish Academy of Sciences participated in the ESPON research project “Comparative Analysis of Territorial Governance and Spatial Planning Systems in Europe (COMPASS)” in 2016-2018. We invite you to read the results. New ESPON project "Territorial Scenarios for the Baltic Sea Region (BT2050)"
The Institute of Geography and Spatial Organization Polish Academy of Sciences participates in the implementation of the ESPON project (European Observation Network for Territorial Development and Cohesion) entitled "Territorial Scenarios for the Baltic Sea Region (BT2050)". Read more … New ESPON project "Territorial Scenarios for the Baltic Sea Region (BT2050)"
In 1999 at the ISB Congress in Sydney the Commission for developing the Universal Thermal Climate Index UTCI was established. In 2009 special COST Action 730 „Towards a universal thermal climate index UTCI for assessing the thermal environment of the human being” has successfully completed the work proposing UTCI as a new tool in biometeorological and bioclimatic research. 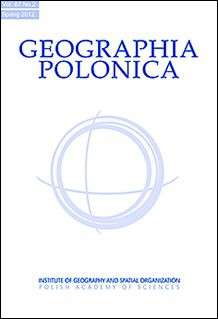 Institute of Geography and Spatial Organization Polish Academy of Sciences, together with the Ministry of Development Republic of Poland, Committee of Geographical Sciences, Polish Academy of Sciences and Polish Geographical Society invite on Warsaw Regional Forum 2017 - "Space of Flows" (18-20 October 2017, Warsaw).